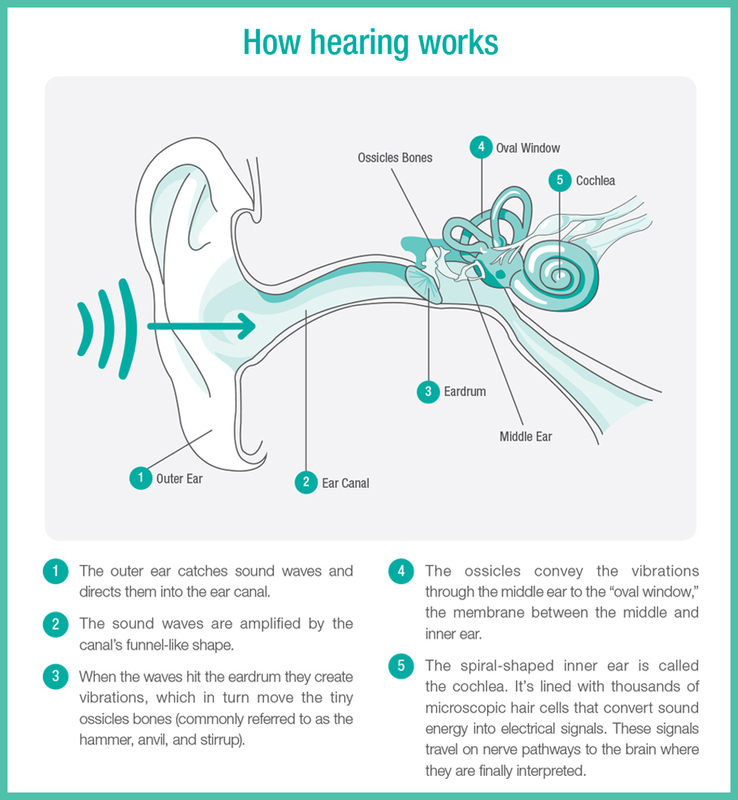 Hearing is a complex process that involves many parts of the ear working together to convert sound waves into information that the brain understands and interprets as sounds. The ear consists of three main parts as seen in the diagram: the outer ear (the external ear and the ear canal), the middle ear (the ear drum and the three very small bones that make up the ossicular chain: the malleus, incus and stapes) and the inner ear (the cochlea and auditory nerve). The sense of hearing is an intricate balance of processes requiring a series of actions and reactions to work. The sound waves are amplified by the canal's funnel-like-shape. When the waves hit the eardrum they create vibrations, which in turn move the tiny ossicles bones (commonly referred to as the hammer, anvil, and stirrup). The ossicles convey the vibrations through the middle ear to the "oval window", the membrane between the middle and inner ear. The spiral-shaped inner ear is called the cochlea. It's lined with thousands of microscopic hair cells that convert sound energy into electrical signals. These signals travel on nerve pathways to the brain where they are finally interpreted. Most hearing loss occurs when the tiny hair cells in the inner ear bend or break. Physicians believe that prolonged exposure to loud noises and heredity are the main factors that contribute to hearing loss over time. Other causes of the damage can be related to: viral infections in the inner ear, medical treatments like chemotherapy and radiation, hear injury or age.